In the past, we've brought you sound recordings from the 19th century -- recordings that recapture the long lost voices of figures likes Walt Whitman, Alfred Lord Tennyson, William Gladstone, Tchaikovsky, and Thomas Edison. Now, thanks to the "dramatic application of digital technology," the Smithsonian brings you (quite fittingly) the lost voice of the telephone's inventor, Alexander Graham Bell. According to biographer Charlotte Gray, Bell recorded his voice onto discs while conducting sound experiments between 1880 and 1886. Although the discs remained in the Smithsonian's possession for decades, researchers lacked the technical ability to play them back, and Bell's voice went "mute" until Carl Haber, a scientist at the Lawrence Berkeley National Laboratory, figured out how to take high resolutions scans of the discs and convert them into playable audio files. That's what you can hear below. 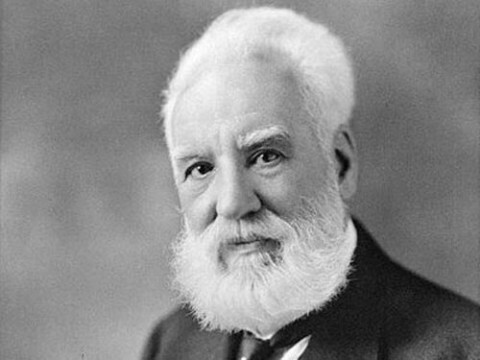 In the short recording dated April 15, 1885, the inventor declares: "Hear my voice -- Alexander Graham Bell."